American Girl, whose mission is to celebrate girls, wants to help you make your girl’s dreams come true! Two weeks ago, they announced the American Girl Dream Come True Sweepstakes, running online at americangirl.com/dreamsweeps from June 22 to October 31, 2015, and they will be giving away ten (10) BeForever American Girl dolls! 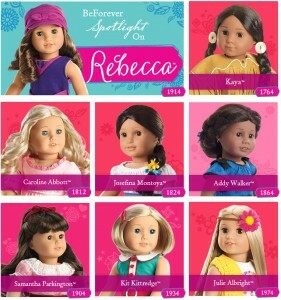 As one of the winner, you’ll get to choose the right one for your girl among Rebecca, Kaya, Caroline Abbott, Josefina Montoya, Addy Walker, Samantha Parkington, Kit Kittredge and Julie Albright. Step into the world of BeForever for adventures as big as a girl’s imagination! Each character features a story series that explores her era so your girl can discover how all girls share the same hopes and dreams. Ready to enter? Visit americangirl.com/dreamsweeps during the Sweepstakes Period and register by providing your contact information such as your first and last name, email address, date of birth, and complete mailing address or simply connect with Facebook to be entered into the Sweepstakes for that day. Repeat every day through October 31, 2015 to earn up to one hundred two (102) total entries. All entries must received between 12:00 a.m. ET on June 22, 2015 and 11:59 p.m. ET on October 31, 2015 to be eligible for the grand prize drawing. On or around November 2, 2015, American Girl will randomly select ten (10) grand prize winners who will receive a BeForever Prize Pack consisting of winner’s choice of BeForever American Girl doll plus matching doll-and-girl pajama set! Wondering if you are eligible to enter and win? If you are a legal resident of any of the fifty (50) United States (including the District of Columbia) or Canada (excluding Quebec), who is at least eighteen (18) years old at the time of entry, you are eligible to enter the American Girl Dream Come True Sweepstakes. Good luck! Looking for the November sweepstakes ?